Monacolin K are considered of benefit to the management of cholesterol – monocolin K is similar to Lovastatin. In a recent Annals of Internal Medicine study, patients who took red rice yeast during a 12-week diet and exercise program cut their LDL by 27 percent, compared with 6 percent for those who only dieted and exercised. Used as a natural food colourant, medical product and preservative as far back as the Tang Dynasty in China in 800 AD. It’s a substance taken from rice that has been fermented with yeast, Monascus purpureus. Extensive and ongoing reports show that red rice yeast can significantly lower total and bad cholesterol. 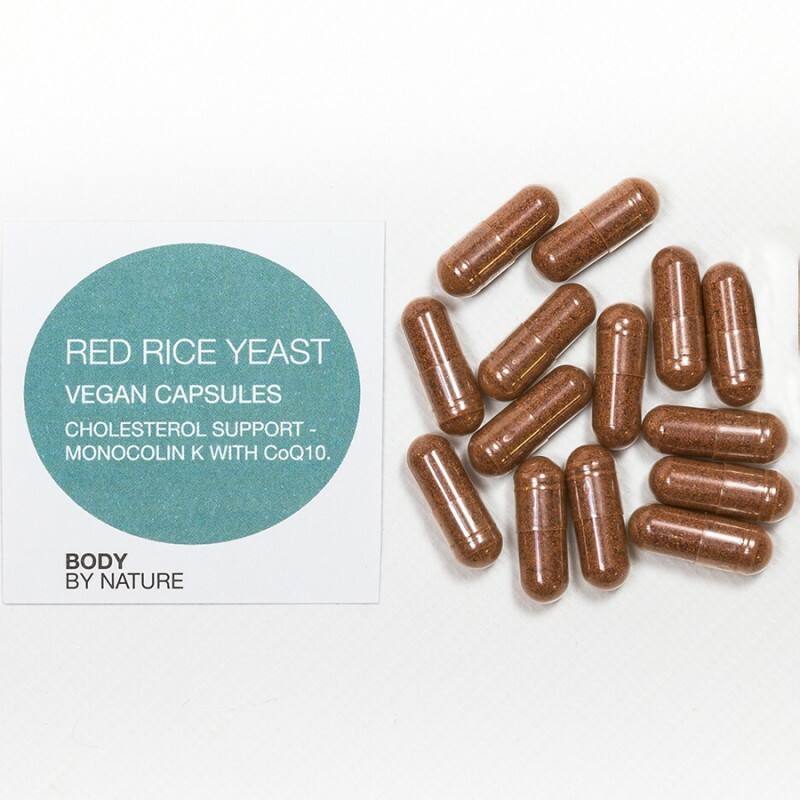 Body By Nature must point out that due to the similarity of actions between both the red rice yeast and statins, we recommend not taking this in conjunction with prescribed statin treatments. Safety Concerns have been raised over the variability of Red Rice Yeast supplements due to the variability of the monocolin levels and the presence of citrinin, a toxin by-product of the fermentation process. Body by Nature customers can be assured that suppliers of our Red Rice Yeast product guarantee the active level of monacolin and an undetectable level of citrinin. Monascus purpureus (Red rice yeast 0.4% monocolin K), crataegus laevigata (hawthorn berry extract 10:1), capsule shell (hydroxypropylmethylcellulose), co-enzyme Q10. Vegetarians, vegans and people with Candida and yeast sensitivities. Children, or during pregnancy or while breast-feeding. People already taking cholesterol-lowering medication should consult with their doctor before taking this supplement.